When the 72 men came back from their trip, they were very happy. They said, "Lord, even the demons obeyed us when we used your name!" 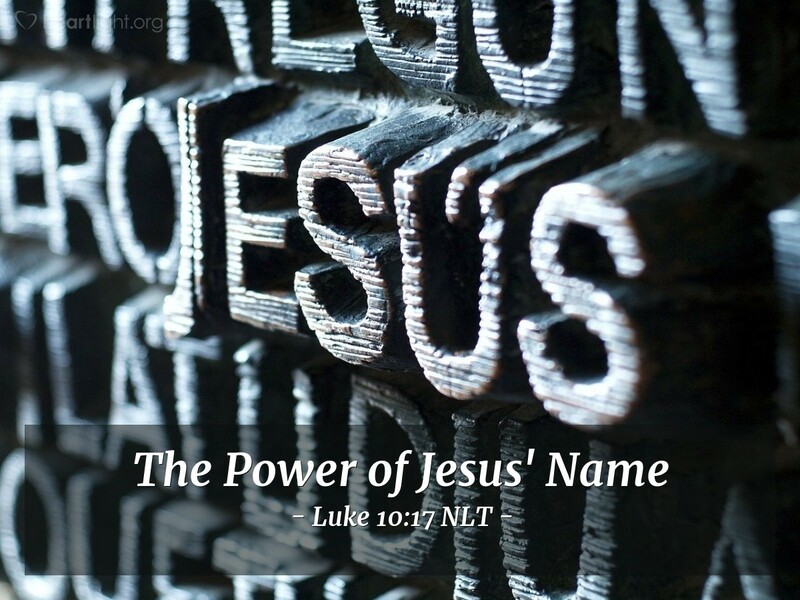 Jesus' name is so frequently used in vain today, we often forget how powerful that name is. We pray in Jesus' name because he intercedes for us with authority and we invoke his power and authority to work in our lives and the lives of those we love—to help them, to heal them, to renew them, to comfort them. Jesus has authority over all powers and forces. They cannot stand up to his authority, character, and truth. His presence in us and his love for us assure us that we have overcome the world because the one in us is greater than the one in the world. Even though many may reject Jesus, we must rejoice because of the liberating power over sin and death that Jesus' presence brings us! I praise you, Father, for displaying your mighty power in the resurrection of Jesus from the dead. I thank you for making that power work in my life as I yield myself to Jesus' authority and trust in his grace. I praise you for hearing my heart when I pray because of the authority of Jesus' name by which I pray. Amen.